Although green teas are usually associated with Asia (in particular China and Japan), there are places for high quality green tea all over the world. Green tea retains it's color and flavor by stopping the oxidization thru direct application of high heat. 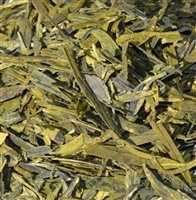 Green tea leaves are created with either steam or by cooking the leaves in pans. Traditionally, the Japanese are known for steaming tea leaves to keep them green, while the Chinese are known for using the dry pan method.The goal is to seal in the flavors and colors of the tea as quickly as possible, within the first hours after the tea leaves are picked.